2005 Girls Headed to Presidents Cup Semi-Finals! 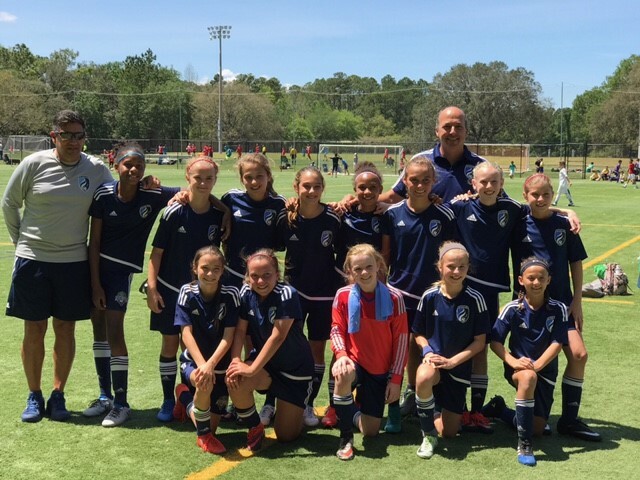 The West Florida Flames U12 Pre-ECNL Girls 2005 soccer team beat Jacksonville FC Armada 4-1 and Miami Sunrise Sting 3-1 this past weekend in the Sweet 16 and Elite 8 to advance to the State Final Four in hopes of repeating as State Champs in the 2017 Presidents Cup! The core of this team won the Presidents Cup State Championship as U11's last year. Jacksonville was ranked #2 in the State and Sunrise was ranked #3 in the State. The journey continues in three weeks at the Final Four. In the State Semifinal the West Florida Flames play TBU Premier 2005 on Saturday, April 29th at 3:30pm at the Lake Myrtle Sports Park at 2828 Lake Myrtle Park Road, Auburndale, FL 33823. The game is on Field #2. We'd like to invite all Flames families to come out and cheer on the team to victory over TBU! The State Final will be played the next day on Sunday, April 30th at 8am against the winner of the other Semifinal between Orlando City and Weston on Field #2. This 2005 girls team is coached by Jim Delisle, Remo Hernandez and Jorge "Yoyo" Zavala.